AT HUBERT EATON SCOUT RESERVATION! Today, Hubert Eaton Scout Reservation boasts over 2,000 acres of prime Scouting territory in which Scouts can experience a wide variety of programs such as rappelling and climbing, C.O.P.E., Outpost program and, of course, a diverse Merit Badge program. It is in the image of this fine past that has culminated in what we are today that we find the example that will guide our footsteps as we continue to serve the needs of our youth, one Scout at a time. 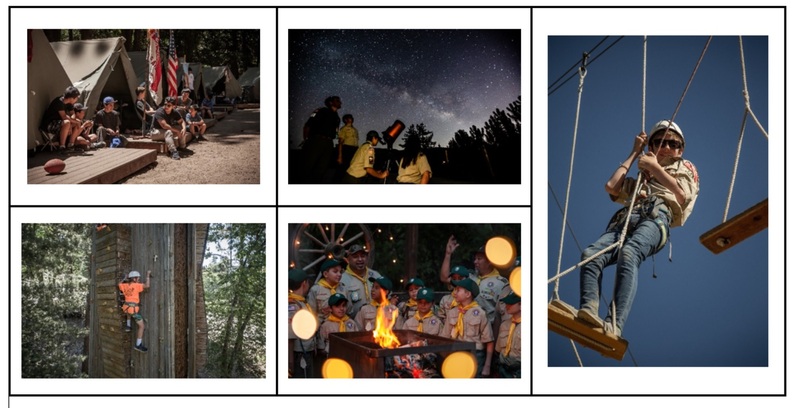 LET OUR STAFF HELP YOUR SCOUTS MAKE MEMORIES THAT WILL LAST A LIFE TIME! **All units that sign up by November 1, 2018 will receive a free 2019 Summer Camp T-shirt for each camper that attends! **NOTE: All changes in camper numbers must be submitted in writing by the reservation contact (email, mail or in person) to the camping department. No change in camper numbers will be accepted over the phone. Cancellation Policy: All payments are non-refundable and you will forfeit the money paid on spots you drop. A $200 initial deposit per unit is required at the time of making a reservation. This deposit is non-refundable, but is applied to your final total. First payment of $100 per person is due no later than Thursday, January 31, 2019. Second payment of $100 per person is due no later than Thursday, February 28, 2019. Third payment of $100 per person is due no later than Friday, March 29, 2019. Total Balance is due no later than Tuesday, April 30, 2019. There is a $10 discount for pairs of brothers attending camp together. The price per pair can be reduced by $10 (or $5 per brother). This discount will be applied to your reservation before the Final Balance is paid (not before April 15th, 2019). If you neglect to make a payment your unit’s reservation will be dropped and you will forfeit all money paid. Payment methods include cash, check, VISA, MasterCard, Discover or American Express. Checks should be made payable to GLAAC – BSA and mailed to 2333 Scout Way, Los Angeles, Ca 90026 with a copy of your statement. Your help in following this schedule will allow the Scouts in your troop to budget for camp, as well as helping our council provide the maximum number of spaces possible to Scouts who wish to attend. Thank you for your help! For more information or questions, please don’t hesitate to contact the camping department at 626 351-8815 x249 for Sonia or x241 for Danette.or x241 for Danette. ***NOTE: All changes in camper numbers must be submitted in writing (email, mail or in person) to the camping department. No change in camper numbers will be accepted over the phone. Cancellation Policy: All payments are non-refundable and you will forfeit the money paid on spots you drop. 1. A $200 initial deposit per unit is required at the time of making a reservation. This deposit is non-refundable, but is applied to your final total. 2. First payment of $100 per person is due no later than Thursday, January 31, 2019. 3. Second payment of $100 per person is due no later than Thursday, February 28, 2019. 4. Third payment of $100 per person is due no later than Friday, March 29, 2019. 5. Total Balance is due no later than Tuesday, April 30, 2019. 6. There is a $10 discount for pairs of brothers attending camp together. The price per pair can be reduced by $10 (or $5 per brother). This discount will be applied to your reservation before the Final Balance is paid (not before April 15th, 2019). If you neglect to make a payment your unit’s reservation will be dropped and you will forfeit all money paid. Payment methods include cash, check, VISA, MasterCard, Discover or American Express. Checks should be made payable to GLAAC – BSA and mailed to 2333 Scout Way, Los Angeles, CA 90026 with a copy of your statement.